Several lines of evidence indicate that the Guiana Shield region (a distinct phytogeographic region encompassing Guyana, Suriname, French Guiana, and portions of Venezuela, Brazil and Colombia – Map 1) has a high concentration of neotropical woody plant genera that host EM fungi (Funk et al., 2007; McGuire et al., 2008). Knowledge of EM plants and their fungal symbionts is critical to understanding the dynamics of neotropical forests, particularly those of the Guiana Shield. Within Guyana we have selected sites for exploration and sampling within the Pakaraima Mountains and the surrounding lowlands (see Map 2). These include: 1) sites with established permanent plots with detailed woody plant and macrofungal sporocarp inventories, and confirmed EM host plants occurring at high (Dicymbe corymbosa, D. altsonii) and low (D. jenmanii, Aldina insignis) conspecific densities (Upper Potaro and Upper Ireng River Basins, west-central Pakaraimas), and 2) areas of the Pakaraimas and outwash drainages off the Pakaraima plateau with confirmed or putative EM host plants ranging from low (Coccoloba excelsa, Coccoloba cf. marginata; Iwokrama and Mabura Hill Reserves) to high densities (Pakaraimaea dipterocarpacea, Upper Mazaruni Basin). The degree of site characterization and number of relevant previous studies vary among the sites from relatively high at Upper Potaro (e.g. Henkel et al., 2005a, 2002; Henkel 2003; Henkel et al. 2012) and Mabura Hill (e.g. Zagt, 1997; ter Steege et al., 1993), intermediate at Upper Ireng and Upper Mazaruni (e.g. Smith et al. 2013; Henkel et al., 2002; Henkel 1999), to low at Iwokrama and Upper Mazaruni (Uehling & Henkel unpubl. ; Clarke et al., 2001; Hoffman & Henkel, 1992). Each site has representative species of several EM plant genera. The Smithsonian “Biological Diversity of the Guiana Shield” research program has already created a preliminary vegetation map for the country of Guyana (Map 4). Map 1. 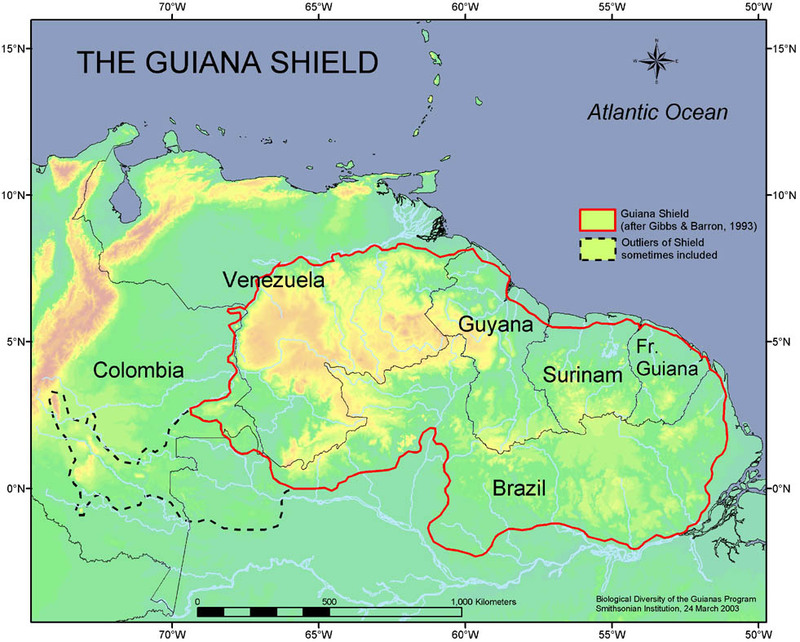 The Guiana Shield phytogeographic region of Northern South America encompasses Guyana, Suriname, French Guiana and portions of Venezuela, Brazil, and Columbia (Smithsonian Institution-BDGSP). Map 2. 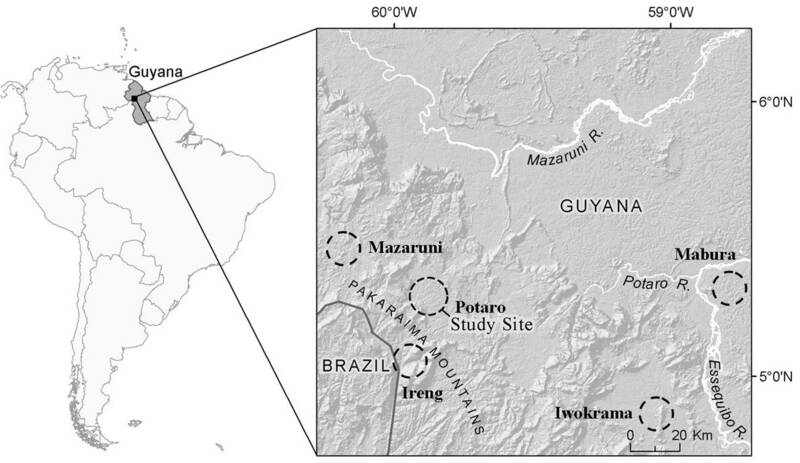 Position of Guyana in Northern South America, location of Upper Potaro study site, and topography of the Pakaraima Montane region (Degagne et al., 2008). Map 3. Thematic map showing predicted forest distribution for the Upper Potaro study site in western Guyana. Supervised classification output for 16_Oct_1999 Landsat-7 ETM+ scene with cloud-covered areas filled using Landsat-5 TM image from 9_Aug_1989. 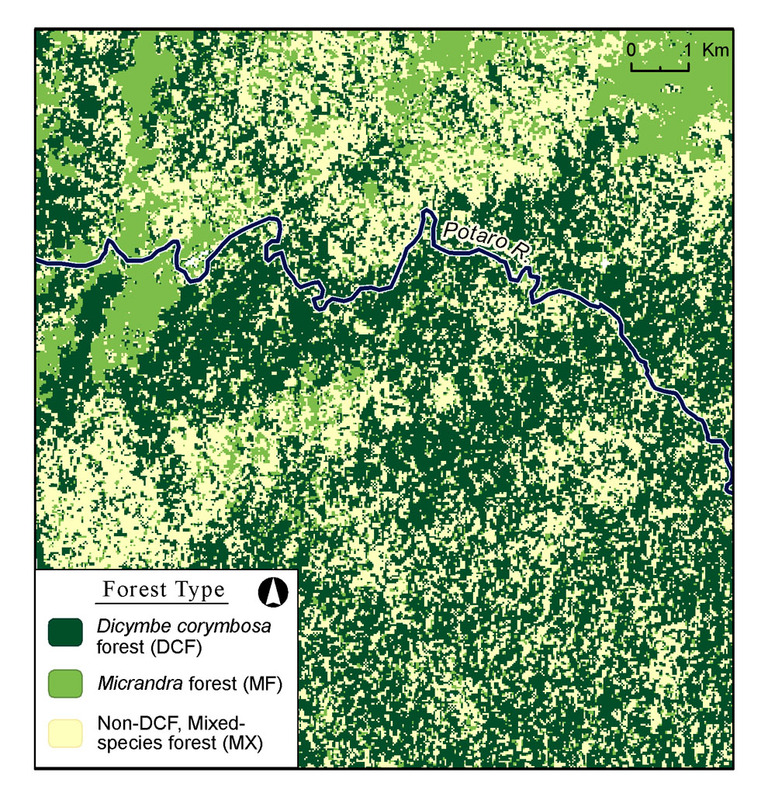 Dark green areas represent Dicymbe corymbosa dominant and monodominant forest, light green depicts Micrandra dominant forest, and light yellow indicates mixed-species forest lacking D. corymbosa (Degagne et al. 2008). Map 4. Smithsonian preliminary vegetation map of Guyana. Clarke HD, Funk VA, Hollowell T. 2001. 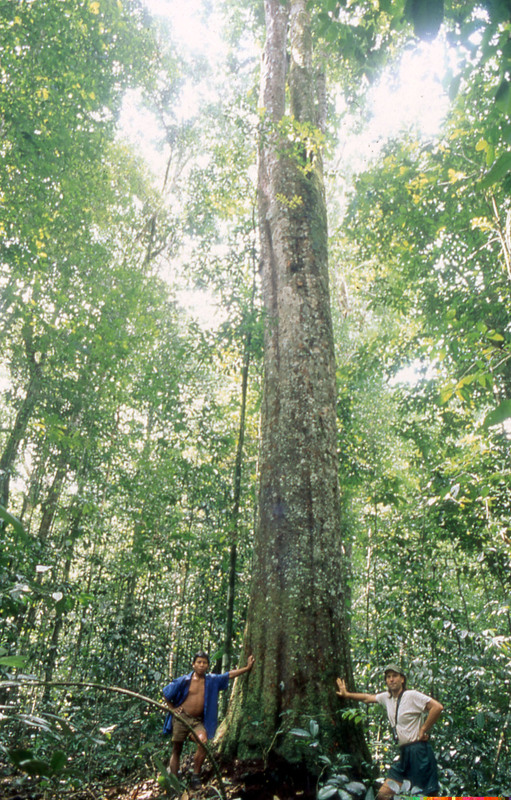 Plant diversity of the Iwokrama Forest, Guyana. Sida Botanical Miscellany 21: 1-86. Funk V, Hollowell T, Berry P, Kelloff C, Alexander SN. 2007. Checklist of the plants of the Guiana Shield. Contributions from the United States National Herbarium 55: 1-584. Henkel TW, Mayor J, Woolley L. 2005a. Mast fruiting and seedling survival of the ectomycorrhizal Dicymbe corymbosa (Caesalpiniaceae) in Guyana. New Phytologist 167: 543-556. [pdf] The definitive version is available at http://www.blackwell-synergy.com/. Hoffman B, Henkel TW. 1992. Report on a botanical expedition to Mt. Ayanganna, Guyana. Smithsonian Institution Department of Botany Report. ter Steege H, Jetten VG, Polak M, Werger MJA. 1993. Tropical rain forest types and soils of a watershed in Guyana. Journal of Vegetation Science 4: 705-716. Zagt RJ. 1997. Pre-dispersal and early post-dispersal demography, and reproductive litter production, in the tropical tree Dicymbe altsonii in Guyana. Journal of Tropical Ecology 13: 511-526.